The density and composition of the earth's atmosphere changes with height above the surface. From the sun, solar ultraviolet radiation impacts the upper atmosphere, ionizing the atoms there in the process of being absorbed. As the density of the atmosphere falls to very low levels the time it takes for ionized electrons and their atomic nuclei to recombine becomes sufficiently long to form a persistant ionized zone. 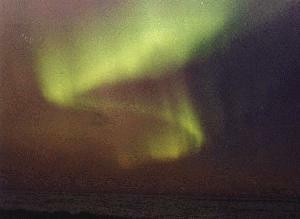 This zone of ionized particles is called the earth's ionosphere. Due to the chemistry of the atmosphere, density variations, and varying energy levels in the ionizing ultraviolet radiation, the ionosphere forms distinct zones or layers which have been given the rather unimaginitive names of D, E, F1 and F2 with increasing height above the earth. With the complex interplay of the different factors involved, the ionosphere varies considerable with time. 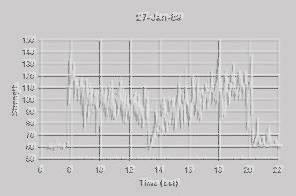 Regular variations form from the diurnal rotation of the earth bringing differents parts of the atmosphere under the radiation effects of the sun, and from seasonal changes, and from the regular change in solar energy associated with the sunspot cycle. Other more random variations result from interactions of the earth's magnetic field with the charged particles in the ionsphere, and from disturbances to the magnetic field by solar activity. Its behavoir also varies by latitude, with polar, mid-latitude, and low-latitude regions all behaving in characteristic ways. The early study of the ionosphere involved measuring its density variations and electrical properties. Most work was done in conjunction with radio studies and radio waves remain the primary way to probe its structure. Studies focus on its variability and the nature and causes of disturbances. In the process much has been learned about the solar-terrestial connection. With a communications receiver and an inquiring mind, anyone can reach above the sky and touch the near-space environment.